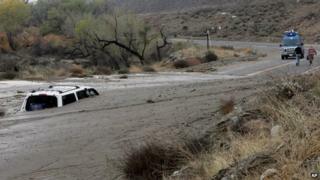 Heavy rains in southern California have triggered mudslides and flooding, killing one person and forcing the evacuation of hundreds of homes. The body was found in a drainage canal in a southern suburb of Los Angeles. Another hard-hit area was the town of Camarillo Springs, 50 miles (80km) north-west of Los Angeles, where a mudslide left 18 homes uninhabitable. The same storm closed major roads and caused power cuts in the San Francisco area on Thursday. More than 200,000 people were still without power on Friday further north in Oregon and Washington state. National Weather Service meteorologist Mark Jackson said that rain had been falling at a rate of nearly two inches (50mm) an hour near Camarillo Springs, before a river of mud and rocks hit the community. Officials ordered the evacuation of more than 100 homes in the town. Further east in Glendora, another 1,000 people were told to leave following mudslides. In Los Angeles, rescue teams saved two people from the Los Angeles River. Three deaths have already been blamed on the harsh weather, including homeless man and son killed in Oregon on Thursday morning when a tree toppled onto their tent.